Council of Europe is considering banning extreme-right members if they are affiliated with “neo-Nazi, racist and anti-Semitic" parties. 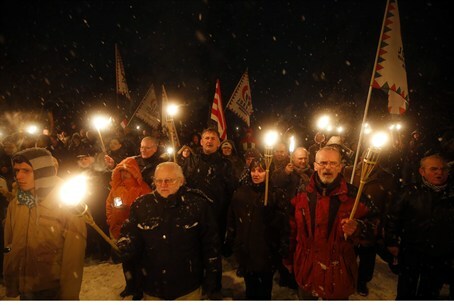 The parliamentary assembly of the Strasbourg-based Council of Europe is considering a ban on some of its extreme-right members if they are affiliated with parties that are considered “neo-Nazi, racist and anti-Semitic," The European Jewish Press (EJP) reported. Over 30 members of parliament on Monday expressed support for the proposal to challenge, according to the Rules of Procedures of the PACE, the credentials and the committee membership of Greek MP Eleni Zaroulia and of Hungarian MP Tamas Gaudy-Nagy. The initiative, presented by Italian MP Fiamma Nirenstein, concerns the membership of the two parliamentarians who belong to the Hungarian Jobbik Party and the Greek Golden Dawn Party, both of which are known for their blatant neo-Nazi, racist, anti-Semitic policies. The request to comply with the rules of procedure of the Council of Europe will be examined by the Council’s Committee on Rules of Procedure, Immunities and Institutional Affairs, according to EJP. "The positions expressed by the two MPs are not compatible with rule 3 of the Statute of the Council of Europe, which asserts that every member must accept the principles of the rule of law and of the enjoyment by all persons within its jurisdiction of human rights and fundamental freedom, and collaborate sincerely and effectively in the realization of the aim of the Council…”, declared Nirenstein. Both the MPs express a political culture that discriminates and persecutes those whom they consider different, she said. In October, Eleni Zaroulia declared that the immigrant are "subhuman," while Tamas Gaudy-Nagy, for his part, spoke about "the Holocaust industry" as a tool in the hands of the Jews to control the world. According to EJP, Nirenstein recently announced she was leaving Italian politics and immigrating to Israel. “I think we have opened here a fundamental reflection on a problem connected to the growth in Europe of neo-fascist parties and of a social diffused culture of hate and racism. no democratic parliament should accept them," she added.